The worst thing that could have possibly happened to the Brooklyn Nets heading into their first season in their shiny new building in Atlantic Yards was for the team to be irrelevant. Constructing a roster even vaguely similar to what the team has been putting on the floor in New Jersey the last few years was simply not an option — only one chance to make a first impression, and all that. If the Nets start out in Brooklyn with a dull, listless, losing roster, that becomes who they are: same old Nets. General manager Billy King, like coach Avery Johnson, came to this sorry franchise with these few days in mind, the days when free agency opened, when the Brooklyn Nets were a reality, when they had legitimate cap space to spend and a high risk tolerance. Yesterday morning, the Nets essentially had four players on their roster. Today, it's a legitimate possibility that they have a Big Three that surpasses the Knicks' and challenges the Heat's. It's been a good 24 hours. To be clear: King is only one third of the way there. 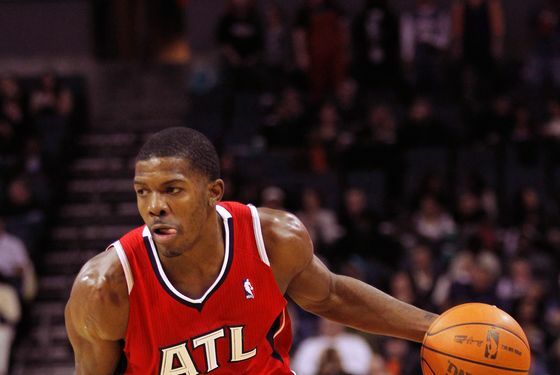 Last night, he traded Anthony Morrow, Jordan Farmar, Jordan Williams, Johan Petro, DeShawn Stevenson, and Houston's 2013 first-round pick — essentially, nothing — to the Atlanta Hawks for Joe Johnson. Now, Johnson is dramatically overpaid, and the Hawks were desperate to get rid of him. But King used roster flotsam to bring in a potential superstar No. 3, or even a No. 2. This move makes less sense if Deron Williams — who met with the team last — doesn't end up signing, but Williams is known to be a fan of Johnson's game, and the two players are an ideal backcourt team, particularly with Gerald Wallace also in the fold. It's looking increasingly likely that Williams will in fact sign with the Nets — at this point, at least, it'd be a shock if he didn't — and even if the Nets add nothing more to the roster, their starting lineup of Williams, Johnson, Wallace, Bosnian forward Mirza Teletovic (whom they are likely to spend their mid-level exemption on), and Brook Lopez is one of the best in the East. (Plus, they keep MarShon Brooks.) They also still have some draft picks in the next few years (other than that 2013 pick). When you consider where the Nets were yesterday,and where this would put them, it would be a rather revolutionary leap: King (and Mikhail Prokhorov, and Bruce Ratner, and Jay-Z) would have plenty with which to open their building. Again, there are tons of risks — honestly, the Hawks are doing backflips to be rid of Johnson right now — but the Nets had to do something, and they did it. Williams could blow this plan all up by surprising everyone and moving to Dallas (if this happens, by the way, prepare yourself for starting Brooklyn Nets point guard Jeremy Lin), but right now, the Nets brass have to be breathing huge sighs of relief. Potential disaster, starting out at least, has been avoided. And the thing is, they might not be done. Now, again, this is in the rumor stage, obviously. (Then again, so was all the Joe Johnson business yesterday.) And this is, all told, a pretty lousy deal for the Magic. But what if this is their only option? (Sorry, Post: The Knicks aren't an option.) If Howard makes it clear he has to be a member of the Nets, don't the Magic have to eventually make him one? Or somebody does? This is, after all, still a players' league, for better or worse. Again, there's a long way to go here. Williams needs to sign. The Magic would have to take this leap. Everything would have to fall into place. But 24 hours ago, the Nets faced the real possibility of opening their new building with nothing. Now there's a chance they could open it with everything. NBA free agency is so crazy.